Maybe it was the name of this bar that drew me in. "Hacienda" reminds me of the Southwest, the land that means home. "Victoria" reminds me of the Victorian era, my favorite historical and literary era. 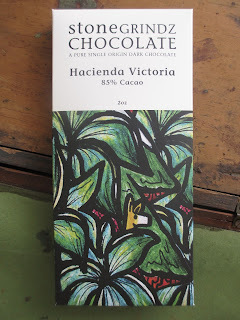 And as I mention, the 85% cocoa content range often ends up being one of my favorites, as well. Everything, in this strange misuse of logic, just seemed to add up correctly. Stone Grindz sourced the cocoa from this bar from western Ecuador. There is some additional information on the inside of the card box about the cocoa variety (Nacional Arriba Ecuador) and the cocoa farm from which it came (Hacienda Victoria). The tasting notes are almond butter, raisin, and toast. 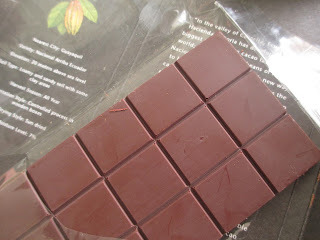 The chocolate's aroma is perfect: it brings that silvery scent that is light yet also rich and smooth. Most definitely this chocolate tastes of raisins. Almost immediately you get that deep, dark, dried fruit flavor. While raisins aren't necessarily my favorite food (I guess I do like them on their own, just not baked into anything, you know? I know I'm not alone in this opinion), the raisin flavor note in chocolate tends to be quite nice. In this case, it becomes a little springier and redder after a moment, then a hint of bitter zing sweeps by. This zing comes across not "bitter," though, simply as raisin richness. A sort of sweet taste comes in towards the end, like some kind of sweet spice. The finish is smooth and tender in flavor. The line between rich and sweet. The place between bold and light. The moment between calm and action. That is this chocolate, balanced at a perfect place that simply feels like purity. This is the kind of chocolate that makes you fall in love with it.